Who says gingerbread men are just for Christmas? (Really, who does say that? I’m assuming someone does) It’s time to rip off the lederhosen and get ready for a Halloween edition. First we’ll need our little cookie people. I’m calling these gingerbread men because that seems appropriate, but they are not gingerbread at at all. This is what I started making when I whipped up the cookie dough I posted on Monday. You certainly could use our Gingerbread Cookie recipe, but I’m going for Chocolate. Cinnamon and Orange give these chocolate cookies a warm, spiciness that seems fitting for spooky little Halloweeny people. Also, it’s important to have a really great tasting cookie here because we’re not slathering it in buttercream icing. The cookie has to be able to stand out on its own. I’m also using royal icing. I was going to do a whole tutorial on it, but I think I’ll come back to that at Christmas time when cookie decorating is in full swing (and I can practice more and find out if I can actually make cookies that don’t look like they were done by a four year old.) If you’re not familiar with it, royal icing is a basic powdered sugar based icing, but it also uses meringue powder. You can fine meringue powder in cooking and craft stores (in the cake decorating aisle) and even at Walmart where they sell Wilton products. There are lots of brands available online as well. You can simply use the recipe for royal icing found on the container of meringue powder you buy, or visit our favorite cookie goddess Bridget, at Bake @ 350, who has a great tutorial, found here. It’s been a while since I’ve dabbled with royal icing; since I discovered Glace, I’ve been going that route (and okay, because me and royal got in a fight a few years back and haven’t talked since), but I’m happy to say that this go-around was a total success! So you may be seeing more royal icing cookies around here! I also used orange extract in my icing. You want to start with your icing at a nice piping consistency. I put mine in a piping bag and used a number 3 tip. Just freehand some little faces on there; there are actually a lot of ways to do a skull! Try drawing a few out on paper if you’re not quite sure how you want them to look. I’m going pretty basic here. Make sure you get 2 eyes and a mouth if you want one. I switched to a larger tip for my bones (a #5) so I just started using that one for my faces as well. It’s a little thick, but it worked and I didn’t have to change tips, so just play around with what you have and see what works for you. I know that after looking at these cookies you will all be shocked to know that I am not an expert in human anatomy. I probably should have consulted my husband since he is an actual expert, but whatever. They’re cookies. I made a line straight down and then doubled over on that bottom bone because, I don’t know, it seemed like it should be bigger. Then just pipe on some ribs. Then add some little bone shaped bones (bone shaped bones? hmmm…) and a few dots. 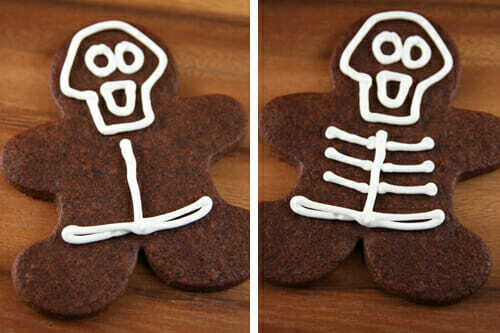 Because as you all should know, cookie skeletons have only 3 fingers on each hand. and then used that same toothpick to spread it around into all of the open spots. The icing should be thick enough that it can hold it’s shape when you drizzle it on, but thin enough that you can easily push it around. You’ll want to let them dry for several hours so the icing can harden, and if you plan to stack them, then definitely let them dry for a full 24 hours. It’s worth the wait; they’re adorable. After they’re dry, just attach them to your cookies with a bit of wet icing. I never realized how “cute” skeletons could be! And somehow they just get cuter when you see a bunch of them together. I love how all of the faces are a little different, and with hearts and bows, they all just take on their own little personalities. I know; I’m getting too attached. It’s really too bad since I’m going to bite their adorable little heads off. A cute and spooky cookie perfect for Halloween! 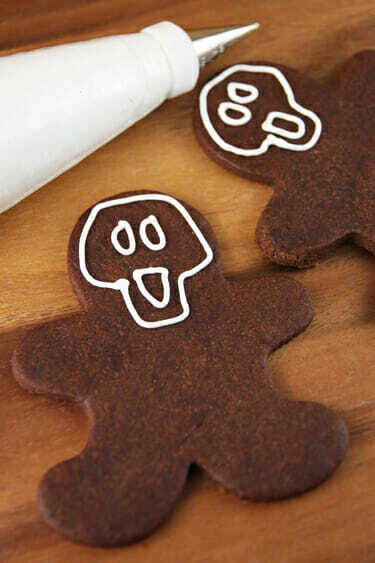 Cut cookies into gingerbread men shapes. Bake and cool completely. 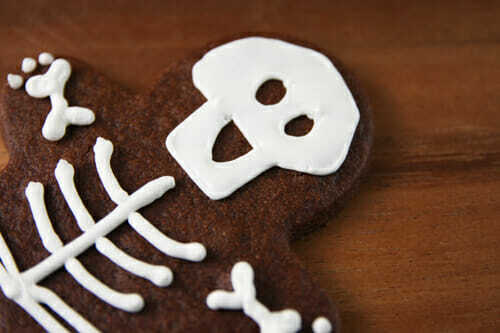 Pipe faces on cookies and then remainder of skeleton design. Add water to royal icing until it resembles a thick syrup. Drizzle onto open space in face design and use a tooth pick to spread it out and into the crevices. Let cookies dry completely, several hours or overnight. 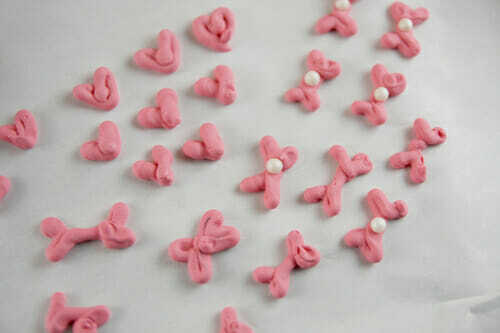 To make hearts and bones/bows, use food coloring to tint icing to desired color. Pipe designs onto parchment paper and let dry until hard. Gently remove from parchment and attach to cookies with a dab of wet icing. Bite cute little heads off. Aww so cute! Love this. Those are darling!!! Thanks for sharing! Sara, how are Royal & Glace icing different? (texture, taste, easier…) If you liked Glace better why did you want to try Royal icing again? 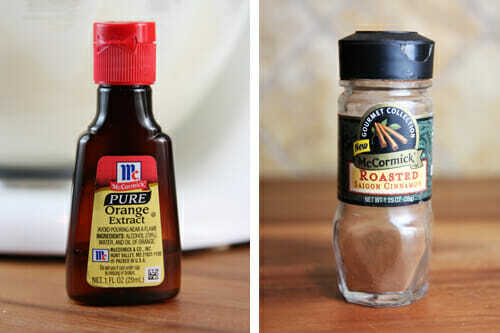 They both have about the same ratio of powdered sugar to water or milk. The difference is that glace then has corn syrup added and royal has meringue powder. The glace is just whisked and it’s like a thick, thick syrup. Royal icing is beaten and is fluffy and holds a shape. They are used for different styles of cookies. Glace works well for glazing entire tops of cookies, or basic outline and fill. Royal icing pipes better and is better for designs and small piping details. You *could* do these cookies with glace, but it would take a lot longer and be harder I think. What icing you use really depends on the style of decoration you’re doing. What is the recipe for the royal icing? It isnt letting me click on the recipe. I’ve been wanting to try out making cute holiday cookies but never found I good recipe. Try looking up the royal icing on the blog “Bake at 350,” that’s what I used! Hey, I thought mine were going to look like a toddler’s work too; If I can do it you can too! Doesn’t the royal icing get so hard that it’s difficult to eat? I use royal icing to put together my gingerbread houses, but I’ve never had the desire to eat it :p I guess I’ve always saw royal icing as “glue”, lol. It does dry hard, but no so hard you can’t eat it! It’s basically just sugar. The addition of extract really helps the flavor too. That’s why I think it’s great for a cookie like this, where you’re not covering the entire cookie. Love them! Like I needed something else to do right now though. Maybe I’ll make them and take them to my brothers to decorate with the kiddos! Thanks! Absolutely adorable. You are a clever girl. And how cute would it be if the boys wore a little blue bow tie? ohhh, how come I didn’t think of that?? That’s actually genius, but my favorite part is the BOWS!!! YAY! 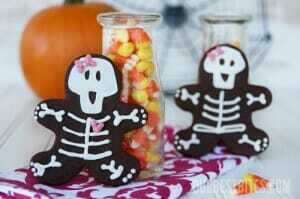 I’m going to have to make those for my boys Halloween parties! SO CUTE!!! wish there was a way to send these to the troops but icing is just not a good idea for travel. What a great idea. I love how they turned out, especially the pink bows and hearts. Love this. I’ve actually made these for a few years with Martha’s gingerbread and royal icing recipes. 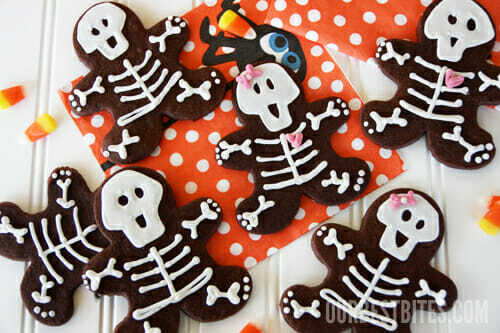 I like to make skeletons out of whatever animal shaped cookie cutters I’ve got around…bats and moose are favorites! Oh, that’s such a cute idea! 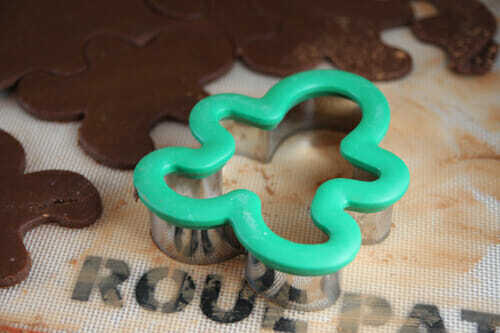 Oh ya, you can totally use cookie cutters. You just want to avoid super sharp knives that can cut through the surface. I use the back side of my sharp knives, or butter knives, and I even use my pizza cutter on it too and it’s held up great. I love this idea! I love gingerbread, but it’s sad that it’s only made in one month out of the whole year. Thanks for making an excuse to bake them more often. These are too cute! I’m thinking these are heading into my plans for the weekend…how cute!!! super fun and cute! thanks! These are cute! I teach an “inside the Human Body” unit to my 5th graders and these would be a hit for when we cover the skeletal system. These are so darned cute…..and I LOVE the mummy at the end! Fun! These are adorable!!! I love the mummies too! These are so adorable! 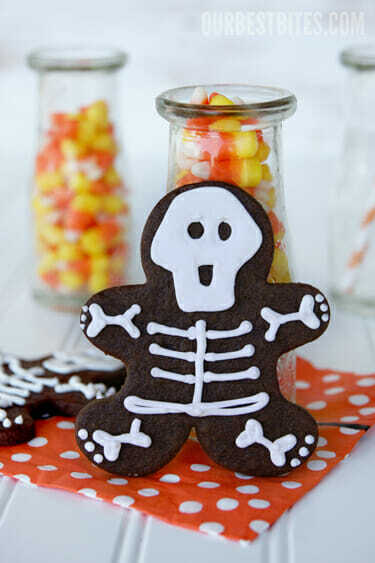 I love the Halloween twist and I’m entirely ready for gingerbread men in my life…especially the chocolate variety! Okay, I should really refrain from going to your website for ideas. 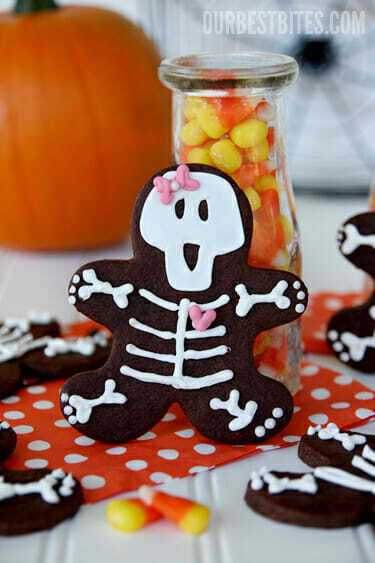 After just baking 250 mini candy corn cupcakes for my daughters’ Canadian Thanksgiving Feast at school, I am now tempted to bake these adorable skeleton gingerbread men/girls. You don’t know how much of an obsession I have with all things gingerbread men!!!! Sara and Kate, you tempt me EVERY time!!! I wondered if you had any ideas of good food to sell at a craft show. Something not to time consuming or things to make in advance! I use your recipe book a lot! Just thought you might have some good ideas!! Oh my, they are soooooo adorable! Great idea!! I love the idea of adding orange and cinnamon to the cookies to make them different than regular cookies. Not to mention they’re just plain adorable! You are so cute. The end. You are so incredibly creative. Wow…so cute! What kind of frosting works best for the mummies? How did you drizzle it? The picture looks like it was piped with a flat tip. P.S. 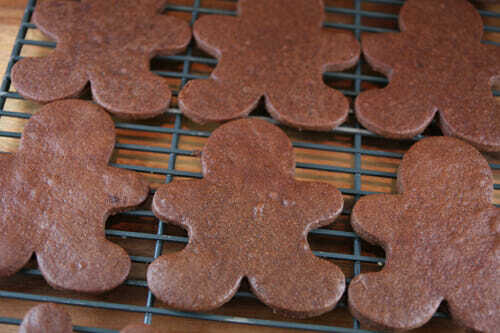 I want that cute little chunky gingerbread man cookie cutter! Where did you find him? My gingerbread cutter looks a little immaciated. Aw, these are so adorable! I swear I saw the same idea somewhere before but I can’t remember where. And I’ll bet yours turned out nicer 🙂 The little bows and hearts are great and the mummy cookies are great too. Also I think you could probably use buttercream frosting! It hardens when left out long enough. The cookie recipe itself looks great, I was tempted by your Chocolate Vaders but if I try it I’ll definitely go the Orange-Chocolate-Cinnamon route! Ok I just have to say that I look at your site almost daily because my brain is fried and I rely on you to come up with my dinner plans 🙂 So I saw these cookies today and it gave me quite a chuckle! 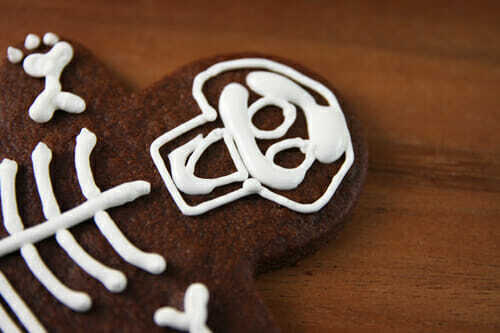 They are so cute and who wouldn’t love a skeleton or mummy cookie?! 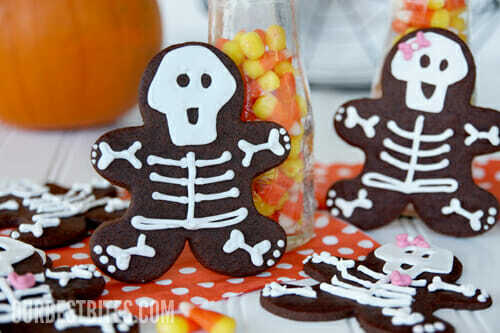 By far the cutest Halloween cookies I’ve ever seen. A must-make for our family! Hi! How many days do these cookies stay nice and moist? 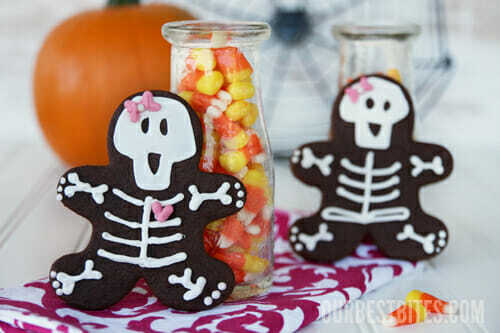 I’m looking to send a care package, and wanted to include some cute Halloween cookies like these! Do you think they would mail well, and if not do you know other baked goodies that do? Thanks! I honestly don’t know Megan- I’ve never kept them longer than a day! But I imagine they would be fine. Sugar cookies with glace icing would be great too. Click on the link in our sidebar for spider web cookies; those would be perfect! Also our ginger spice cookies would do pretty well. I love these cookies…so cute! I had to share them today…you are so full of creative ideas! This is a really amazing use of gingerbread cookie dough & cutters before Christmas time. Hooray for gingerbread men in October! Also, those bows are the cutest thing ever. Hi erbrea there! Congratulations what a cute projects. A gingerbread boy and a gingerbread girl, absotlutely gorgeous, and the bow, love it!!! !Thanks for sharing. I just made a batch with and a batch without the espresso. I prefer it without the espresson because its less bitter. They were a lot more time consuming then the I had thought. They did turn out nice but not as nice as yours! I think I prefer your sugar cookie recipe. For some reason, some of the cookies got kind of soft after they cooled down… Keep in mind that the cookies will be really sweet with the mummy frosting…. Oh my gosh! I am totally going to make these this week! LOVE the mummies especially! These cookies are a great idea. Gingerbread is so delicious it should definitely not be limited to one short season! How did you get the mummy cookie frosting to be so wide looking as opposed to the bones? But you can use any tip, or even just put some icing in a ziplock bag and cut off the end. They will still look like mummies! Duh…now I get understand. Thanks for the quick response. Love your website! It one of my favorites that I browse daily. Keep up the good work. These were so inspiring that I has to make some myself for our households annual pumpkin massacre!!! What could be better at a massacre then these cookies! Thank you so much! I made these!! WOOHOO!!! 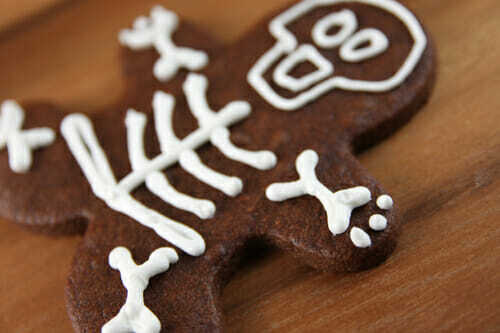 I blogged about them here:http://www.nickyhurt.com/2011/10/skeleton-cookies.html I totally gave you credit. These are great and I’ve gotten a lot of compliments! Delicious! Made these today and I’ll definitely be making them again! 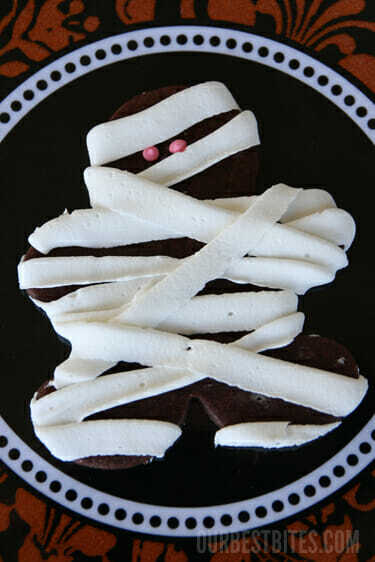 I can’t wait to see my daughter’s second grade class enjoying their mummy cookies! I also have the star wars cookie cutters and am thrilled to have another recipe to use with them! Thank you so much for this cute idea and recipe. I made these for a party today and they were a huge hit. I must say honestly I don’t think I’ll try the chocolate recipe again. The dough was pretty tricky to roll out and the taste was pretty bland. The dough kept sticking to my non-stick rolling pin even though the dough was sprinkled with cocoa powder. Maybe next time i’ll try the same decoration idea with a different dough. I can’t say royal icing and I ever “fell out,” since we never got together-he was always too high-maintenance and finicky! However, I bow to all things OBB and tried it for my Valentine cookies with great success! Thanks for the post! 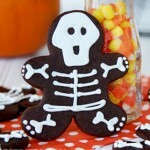 Just made some of these (and blogged about them here – http://beinginspired-blog.blogspot.ie/2012/10/halloween-cookies.html). They are delicious!! Mine aren’t quite as cute as yours though. But I still have time before Halloween to get some more practice in! 🙂 Thanks for the recipe and great idea! This is one of my favorite halloween recipes. I made this last year and I am planning to make them again. I made the mummy cookies but didn’t make the changed you said in the recipe and then I made a mint butter cream frosting. Who doesn’t love mint chocolate?? They are a hit with every one who tries them! Thank you!! These are the cutest little men ever!!!!!!!!!! LOL!!!!!!!!!!! Absolutely brilliant! Will be trying these out for the German School in Prague Halloween party! I have been seeing all the lovely recipes on your blog n have tried a couple. I just want to ask you about the Royl icing… I am from India and it is very difficult to get Meringue powder here. Is there a substitute I can use? I am going to try out your pumpkin bread next week!! So adorable. Making them this weekend! How long will they store in a covered container?